The French bishop of Malta Paul Alphéran de Bussan had donated six thousand scudi for the purposes of the construction of the choir; however he would ever even witness the beginning of this project. After much deliberation, Stefano Ittar was commissioned to oversee the project of the completion of the choir nave. Two pairs of large puttini flank the end of the upper part of the decorative altar. Marble salvaged from the ruins of Carthage was used to create the altar, as well as cover the four pilasters. The Auxiliary Bishop Domenico Sceberras, who was also the titular bishop of Epiphania, covered the hefty expenses required to create an exquisite marble pedestal for the cross found in the middle of the altar. On top of the apse, one can find the coat of arms of the Spanish Royal Family as a memoir to the Emperor Charles V, who gifted Malta to the Order of St. John in the year 1530. Even in the old cathedral, one would find a similar coat of arms which was painted on wood, now preserved in the museum. Prior to the earthquake of 1693, Mattia Preti was commissioned to decorate the choir. From the six works that Preti did for the said choir, one can select the Miracle of the Viper and the Healing of Publius’ Father, as his best output. The choir stalls are yet another remain from the old Cathedral, and are in fact, partially fifteenth century work. In 1876, Emanuele Decelis created the panels with inlaid carvings based on the design of Friedrich Overbeck. 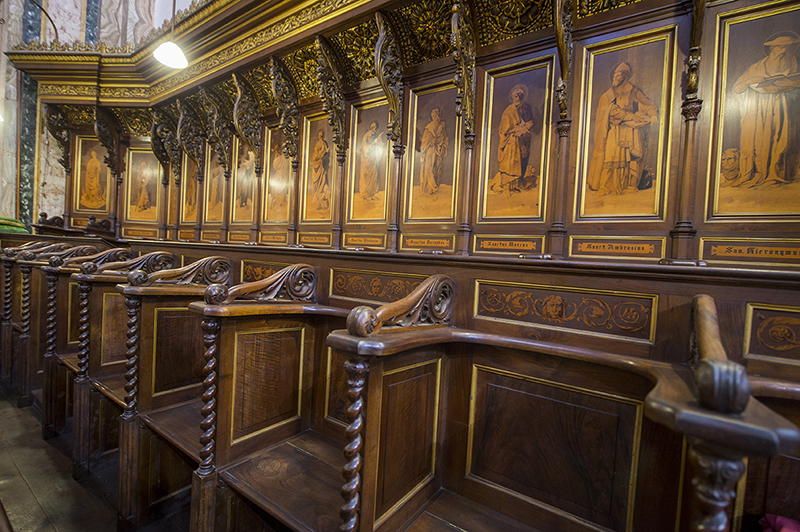 The original panels which dates back to 1481, may be seen in the Cathedral Museum. More intricate woodwork may be found throughout the choir, with designs prepared from the aforementioned Overbeck and also Giuseppe Hyzler. Included in the chancel, floor one can see the coat of arms of Bishop Gaetano Pace Forno.